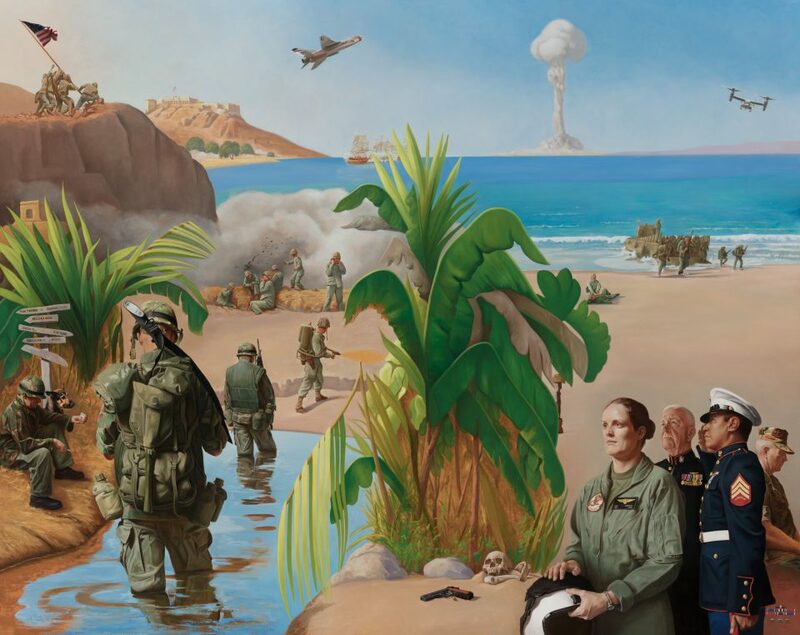 The dedication and ceremony program included Veterans and active duty personnel, some of whom served as models in the painting, dignitaries, Marine Corps re-enactors, and the artist. Welcoming remarks were made by Brigadier General Lowell Kruse, Camp Ripley, and Erik B. Sogge, Cemetery Administrator (MDVA). Also in attendance were Veterans and active duty personnel depicted in painting including Roy T. Edwards Col. USMC (Ret.) Holly Zabinski, Major USMC, and the Military Honor Guard: Valhalla Detachment, Marine Corps League, St. Cloud. Major Zabinski presided with the keynote address. BIO: Major Holly Zabinski was commissioned at the University of Minnesota, Twin Cities in May 2007. Upon the completion of flight school, she was stationed in Okinawa, Japan for three years where she took part in exercises as a CH-46 Sea Knight helicopter pilot in Thailand, the Philippines, Bali, the Republic of Korea, and Japan. She then went to Naval Postgraduate School where she received a master’s in operations research. For the past three years, she performed analysis that informed decisions at Headquarters Marine Corps in Quantico, Virginia and Task Force 51/5 in Bahrain. Major Zabinski is currently learning to fly the MV-22 Osprey at Marine Corps Air Station New River, North Carolina. Her decorations include: Meritorious Service Medal, Navy Marine Corps Achievement Medal, Global War on Terrorism – Expeditionary Medal, and Humanitarian Service Medal. BIO: Roy T Edwards Col. USMC retired. Served in the Marines from 1961-1989. Served two Thirteen month tours in Vietnam, 1965-66 and 1969-70. Flew 295 missions and awarded the Distinguished Flying Cross. Flew many different types of aircraft, but primarily the Marine A-4 Skyhawk. Col. Edwards is married to Arlene Edwards, has a son and daughter living in Charlotte, NC and son who is a Major in the Marines stationed in 29 Palms, CA. Col. Edwards and Arlene reside in Raleigh, NC. Marine Corps painting to be unveiled on Saturday, May 26th at 2:30 PM at the Committal Hall. Early November and in the studio modeling quite a bit is Quintin Sam (left), Mille Lacs Band of Ojibwe and Marine Corps Veteran. He’s not only representing the Marines, he is also representing the Native American population of enlisted service men and women. Read his story here to learn more about Sam and his role in the painting. Today at Camp Ripley Colonel Scott St. Sauver was honored as he retired as Garrison Commander, a post he held for 7 years. He retires after 37 years with the National Guard. The project is grateful for his belief in, and support over the years. On his last day, the Marine Corps painting looks like this, with blue sky. Finally some paint on the canvas! Early August provides a good retrospective of the painting to date. The nine images below are from March through early August, and detail the “sepia” drawing that sets the foundation for painting. Major Holly Zabinski, Aviator and Staff Sgt. Cory Engen (Ret. ), two of the models in the Marine Corps painting spent some time in the studio sharing their stories. Memorial Day at the Minnesota State Veterans Cemetery is emotional and inspiring. Each year since this project began, I have had the honor of being present. The Cemetery itself is a calming, beautiful place, and well-tended by the Cemetery staff. It’s touching to witness the friends and family who visit the gravesites of their loved ones, and one cannot help but be inspired by the many proud Veterans who reflect strength and pride. People of all ages spend time looking at the paintings, and ask me questions about them. But I am aware that the paintings reflect the stories of the men and women of each branch of the U. S. Military, and honor them. The Saint Cloud Times covered the Monument READ STORY HERE, which provides an excellent update of the status of the Monument. The time is here for the Marine Corps painting! A cold December made for a tricky time getting the 8 X 10 foot canvas from the Cemetery to the studio, but it’s in and done. I’ve begun the to get the initial sketches up, including Mount Suribachi, Chapultepec and an F-100 Supersabre and the shores of Tripoli. The canvas arrives…a big blank space. Color studies and character sketches for this painting will appear here as they are completed.